On Tuesday, I will be giving an in-service to some of the teachers at my school to help improve and build their websites. With that in mind, I came across this 20 minute presentation by Cyndi Danner-Kuhn that was made last week as part of the 2009 K12 Online Conference. Cyndi's presentation offers a quick overview of what to include in a website and what free tools are available on the web for teachers who are interested in building their own websites. For more information about the presentation, visit Cyndi's supporting links on her webisite. 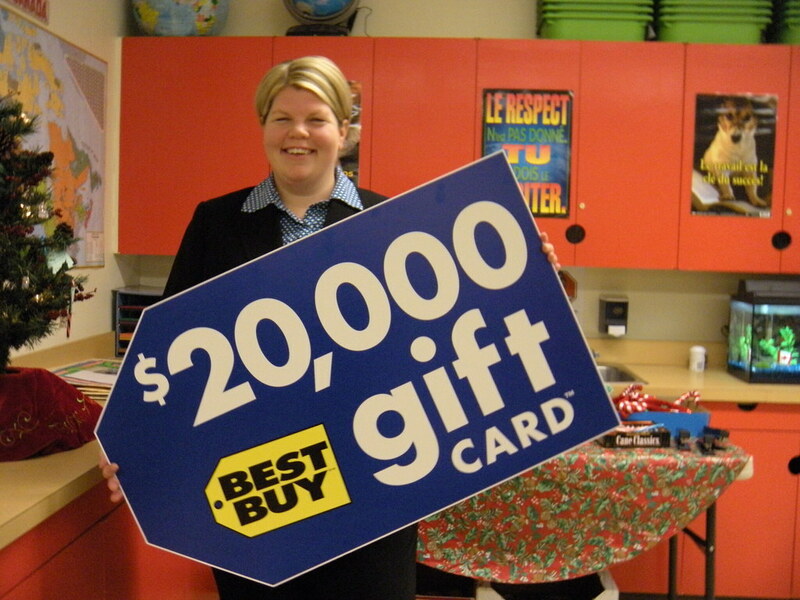 Today, my Grade 7 class and I were happy to accept a gift card from Best Buy worth $20,000 for our video and technology proposal we submitted to the Best Buy "Best in Class" Fund. I wrote about our submission in October on my blog: My Life, our Future - Ma vie, notre futur. If you haven't already checked out our video, please do! My students are very proud of our collective writing project. We were one of 15 classes to be awarded with this prize from across Canada. We are planning on making our classroom virtually paperless with the purchase of a class set of ipod touches, netbooks for all of the students to use and recording equipment so that we can have our own weekly podcast show. Stay tuned to see what we will create with all of our new technology. We are very excited to go shopping and to get started on our new learning adventure in 2010. I have noticed lately that the information that I have posted about using the iPod Touch in the classroom is quite popular. For those of you who have been searching for more information about how to use these devices in an educational setting, you're in luck. Today, while viewing presentations in the KI2 Online conference 2009, I came across a short presentation by Kern Kelley on how to get started with the iPod Touch and the different educational applications that are available. I didn't have time this morning to attend the live session of the K12 Online conference. Fortunately, you can watch the presentations online when it is convenient for you. The keynote this morning was very well done. It was presented by Joyce Kasman Valenza and was entitled "The Wizard of Apps". This presentation featured "a sing-a-long" portion where high school drama students sang songs about the importance of web 2.0 applications to the tune of songs from the Wizard of Oz. The presentation itself is full of great Web 2.0 apps available for teachers to use in their classroom and Joyce does a great job explaining how these apps have been used in an educational setting. View more presentations from joycevalenza. A fascinating and exciting learning opportunity is available now online all month during the K12 Online Conference. You can find out more by visiting the conference's NING or by checking out the schedule on the conference wiki. There are also announcements and news on the conference's blog: K12 Blog Whether you are an educator just starting out with technology integration or a veteran user, there is something for you. 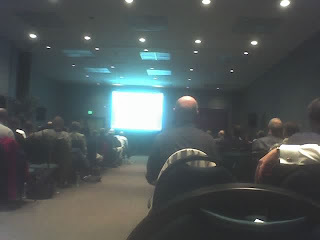 You can even check out archived sessions if the broadcast time is not conducive to your schedule. Kim's 10 years of experience teaching at 3 different International Schools around the world. Her exploration of culture shock as well as her inclusion of perspectives of educators and students from around the world at other International Schools is a great way to start off this online conference. Well done Kim! Check out the sessions over the month. There is something for everyone. One way to introduce my students to the use statics in real life is to show them real-time counters or simulators that are created to count a variety of things the moment you view the page. These living statistics are different than the page counters and other more common counters located on websites and blogs. Those are more static and only change the next time you visit the site. The ones they find most fascinating are the live or real-time counters because they see the numbers grow and change before their eyes. In viewing and interacting with these gadgets and websites, students start asking numerous questions. I find that these types of counters always generate good discussions and inquiry opportunities. We tend to question the creators and their purpose for creating such a counter. We question motive and point of view such as: How are these counters used to illustrate the author's point of view? Can we believe the sources of their statistics? How have the statistics been manipulated to create certain results? One of our favourites to leave up on the SMART Board while students are working on other things is the Breathing Earth which simulates the birth rate, death rate and C02 emissions around the world and displays current world and country populations. Students always generate interesting questions about the human impact on limited world resources while viewing this website. They are also fascinated when they start to compare their country's population and CO2 emissions with other countries that are smaller in geographical size but have much larger populations. Another interesting live statistics website depicts Real Time World Statistics on Reeko's Mad Sciencest Lab. This site has a number of different types of statistics from the general interest "How many McChicken sandwiches have been sold since you began viewing this site?" to the more detailed Science and Energy Consumption statistics. One website I've found that illustrates the use of real-time counters for a lesson or discussion on the author's point of view is the website Immigration Counters.com. This website shows how statistics can be used, displayed or interpreted to illustrate one point of view on immigration. Do you have other gadgets or websites that you like to use with students to demonstrate live statistics? I'm always looking for new and interesting websites and gadgets with live statistics. I would love to hear about the ones that you use or that you have come across. My Grade 7 class works every week with a Grade 1/2 French Immersion class doing paired reading and tutoring. This week is our last session before Halloween so I made up a SMART Board activity for the students to learn a simple Halloween song in French. It is a favourite amongst French Immersion students; "Ces't l'Halloween" by Matt Maxwell. I also used the slides that I made for the SMART Board to make a video. If someone else would like to use this activity, feel free. I found this video really cute. It is perfect for this weeks Friday Funny. Enjoy! Even if I'm not the world's best photographer, it is always exciting to have something published, even if it was unintentional. 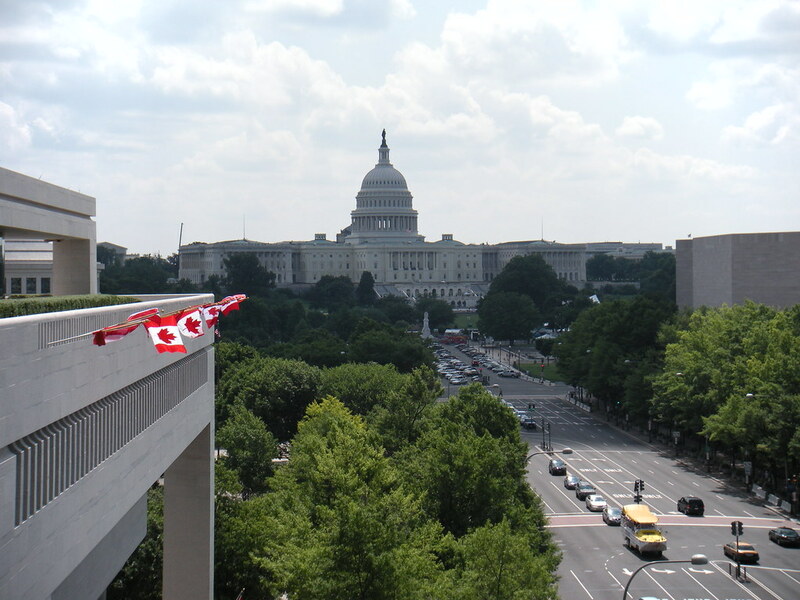 I also think that it is funny that a Canadian can take a photo that later appears in a map program for the US Capitol. Check out this SlideShare Presentation. It is aimed toward business but could easily be adapted to teach about modern storytelling in the classroom. I thought that some people might find it interesting. View more documents from Ed Schipul. After showing my class a number of videos about learning in the 21st Century, I asked my Grade 7 students to come up with their vision of learning in the 21st Century. They came up with some fantastic ideas related to a changing world, using technology and becoming life-long learners. They decided we should produce our video in a bilingual format so that they can showcase their English and French skills. We wrote a collective script in French and then translated it into English. Here's their video. They are so proud of their group effort! Please let us know what you think. I love my iPod Touch and always find it fascinating how many applications there are for it. I wish I could have some for my classroom because of the number of applications that are available for eduational purposes. Earlier this week, I was jealous to hear that the University of Saskatchewan was offering a course in creating an "app" for Smart phones. Now why couldn't I take a cool course like that when I was in University? Even if it wasn't for money making purposes, I think it would be interesting to design applications to enhance your lessons to use on your class set of iPod Touches. You can listen to the story on the CBC Saskatchewan's Morning Edition Podcast that aired on September 14th here. While reading my Twitter Feed today, I came across this video about the use of the iPod Touch in a classroom in England on the Learn 4 Life blog. I had to share because I found it quite interesting. Maybe one of my future projects will be to invest in some iPod touches for my classroom. I think that with the number of applications that they have available now for the iPod Touch, it would be an interesting investment in student learning, especially given the new approach we are using in our school right now based on cooperative, inquiry based learning. I'm looking for other educators who are using iPod touches in their classrooms. How do you use them and why do you find them useful to enhance students' learning? If you have any experiences or insights to share, I would love to hear from you. What is a 21st Century Learner? I have been reading with interest lately, a variety of definitions about "What is a 21st Century Learner?" • Critical Media Network Skills: the ability in a networked environment to recognize when you are being taken advantage of via special interests and the ability to argue within the dominant paradigm of a global network with acuity and accuracy based upon the application of historical, philosophical, creative, and intellectual skills grounded in the history of human thought and applied to the spontaneity and immediate global impact of 21st century networked communications. • Participatory and Networked Information and Communication Skills: the ability to take part in one’s global society on equal footing with any other human via the immediacy and power of digital networks. Long-term, this may mean sharing any variety of networked consciousnesses. • Collaborative Social Meta-Thinking: the ability to learn from and give back to both local community-based and global-based digital social networks. This may extend in future environments to nanotechnology merging with on-demand personalized virtual reality. • Creative Network Confidence and Digital Community Stewardship: the ability to use the global network for both the purposes of creative problem solving and for the benefit of peaceful co-existence between peoples, animals, ecologies, and environments. • Digital Cunning: students will learn that merely ‘using technology’ does not mean that you are either educated in or are a contributing member to the global network. Drawing on a strong Liberal Arts background merged with Digital Age critical thinking skills, students will be able to distinguish between participatory media and authoritarian media even when the latter cloaks itself as the former. • Awareness of Digital History and Digital Divide: the ability to understand historical analog modalities and to recognize the value of pre-digital and non-digital media as well as the temporary nature of specific technologies within historical evolution; the ability to understand and through social action compensate for and help to eliminate digital distinctions based on economics, politics, geography, and race. I also found Warlick's point about the term "engagement" interesting. Instead of making it the responsibility of the teacher to engage the students, he makes it the responsibility of the learner. "...attach the verb to the students. The students will engage with their information environment (textbook, whiteboard, Internet) to learn through questioning, experimentation, discovery, and construction)." Since this is exactly what I'm trying to do this year while working within my new school structure, I think Warlick's post came at just the right time to help me to reflect and to reafirm what I'm trying to do in my classroom. More to come this weekend when I have the chance to reflect on the first 10 days of the school year under a new structure. My preparations for the new school year continue with my latest effort... an animated writing prompt for my Grade 7s. As you may have read in my previous posts, I teach French Immersion so I'm always looking for new things that I can use that let me incorporate the French language into my classroom. I decided to play with a website called GoAnimate. What I discovered was an easy to use, free website that allows me to insert characters, bacgrounds and objects into scenes and then animate their movements using a simple list of posibilities. I inserted their own music and some text. Then, voila, my first short animated feature! I hope they enjoy this activity. I can't wait to see what they come up with! My hope is that this is a successful writing activity that the students will want to revisit during the year to produce more adventures for "Jean and Rosie". I will post the results so stay tuned! I have been working on material for the beginning of the school year and decided to create a "Where did Mme Bobiash go this summer?" activity so students can guess where I travelled based on the landmarks I am photographed with in the puzzle. This is a pretty neat tool that I will be using with my SMART Board in September. The website I used was Jigsaw Planet. Have fun making your own puzzles! Here's the first one I made. It is pretty easy with only 16 pieces. You can make them as easy or as difficult as you want! Gruwell is a teacher from Boston who's work with a group of troubled students was made into a movie in 2007 called "The Freedom Writers". Here is Gruwell's recount of the Freedom Writers' journey. Talks about making connections to students by getting to know them: who they are and what their history is (background). Believing in students that everyone has a story to write about in their marble journal. Tell me your story. Every student has a journey. It starts somewhere – where will it go? Toast for change - Teach to me, not to a test. Meaningful assignment – raise enough money and write enough letters to get Mead Geese to come from Amsterdam to LA to meet the students. And then she came. Student prepared best cultural dishes. No I'm not a hero. I simply did what I needed to do because it was the right thing to do. Please make sure that Anne's life was not taken in vain. Stereotyped kids will begin to believe what others say. Turned their journals into a book to give to the Secretary of Education. They may not change the world, but they would change themselves. I got out because education was the only way to equalize an unfair playing field. The blank screen gave them the power to be immortal. Start an organization to help teachers learn what they need to know about what they need to know to connect to each of their students – the Freedom Writers Teachers' Bootcamp. Why kids do the things that they do. Because doing dumb things doesn't make a kid stupid. Imagine what would happen if you told them that they are brilliant. Leave a legacy – tell people what they need to know about our profession. Education is about believing that every single kid can make it. Blogger – as many blogs as you want with push button publishing customized to your style and needs or wants. Google Alerts – search your name as it appears on the web. "The purpose of this session is to describe a lesson structure called place puzzles. This structure is designed to be simple enough to be used by novice teachers and flexible enough to cover a wide range of learning outcomes. It takes advantage of the growing availability of hand held devices with GPS capabilities and internet access. Place puzzles represent an improvement over field trips as typically implemented because 1) they require prior reading of web-based resources before going into the field; 2) they include 2 to 5 puzzles or riddles that combine knowledge from prior reading with close visual inspection of the environment in the field; 3) they assign roles to learners to create interdependence and involvement by all participants; and 4) they require creative problem solving, analysis and synthesis rather than just factual recall and visual recognition. The format can be applied to learning from the elementary grades up through graduate study. By the end of the session, participants will be able to describe the place puzzle concept, identify areas in their curriculum to which it can be applied, locate existing place puzzles online and use freely available templates and guides to create their own lessons in this format." Due to the nature of the session, I did not take many notes. Please visit the website for full session notes and resources. We need to build upon the possibility of our kids. Foster their spirit and develop their deep understanding of why we use technology and how we use them. Can I see your class? What do students do in your class? -The cocktail party metaphor “This isn't a cocktail party” - What kind of cocktail party do you attend, come and go when you are engaged in the conversation. -can you go through an entire educational technology degree problem without computing? -Where the Chicago Seven martyrs? Literacy is the problem – no one reads, no one takes a note, etc. International example before country example so that biases don't enter into the discussion right at the beginning of the research prompt. overlooked features of a C.O.P. Entry into the community is based on a willingness to imitate the behaviors of the masters. Had students fold paper – demonstration on SMART Board with virtual paper photos or graphics. Paper cut to leave room for notes on paper on sides of Coordinate Plane. Used airliner to draw on quadrants (denoted by different colours) enables classroom management by the teacher and allows for student involvement. Test knowledge using senteo handheld asking questions. My notes are limited due to checking out his website for the following resources and tips. Check it out! It is fantastic! Good resources for finding animations to use in Notebook software. Example-engagement of students- using Smart Board to present about themselves – What happened on your birthday? Jog the Web – (Start lesson with) uses screen shots so students know what they will be looking at when they go to the Library Media Centre website. (http://jogtheweb.com) Shows students what they will be doing on the web. Can provide passwords, recommended websites, how to log-into world book, Royalty free music for schools. What “ends” do you have in mind? Make step-by step directions for instructions that students can refer to. Insert questions into the document for students to test their understanding of the document. Searchasaurus for younger students to search on the internet. Balloon popping to reveal information and pictures. Hide and cover text on Notebook slides. Make up multiple choice questions on cards to answer during presentations. Turning blocks to answer questions. no slides, just a list of windows linked through a tag cloud. Malcolm Gladwell starts of NECC09 with a fantastic keynote! Gladwell's keynote to NECC delegates talked about the importance of creating meaningful learning environments in our classrooms. When we look at someone who masters something, we tend to “telescope” how long it took to learn or master that skill. Meaning we skip over how long it actually took for them to really master a skill. Gladwell said it is important to talk about how long it actually took to master a complex task or enjoy success. Throughout his speech, Gladwell used the example of Fleetwood Mac. This band was not discovered overnight, nor did it enjoy instant success. It wasn't it's first album that was its first #1 hit, it was its 16th album. Gladwell talked about his book Outliners where he discusses the idea of the 10,000 hour rule. His theory is that it takes someone 10,000 hours or 4hrs/day for 10 years of practice before they can be masters of a particular skill or talent. Bobby Fisher – 9 years of practicing chess before becoming a master. Mozart – first big Concerto: #9271 when he was 23 years old after 14 years of practice. Beatles – Practicing in a club in Hamburg 12,000 times live. In the end, the band played together live before coming to America 7 days/week for a number of years. Even with talent, you need to have a great attitude about effort. An approach that says that effort is crucial to me being successful. Another example given by Gladwell was a story about a questionnaire consisting of 120 questions before doing a complex math assessment. Results of countries who are successful in teaching math are those who are successful in teaching or reinforcing the attitude of effort. To do well at math means you need to have a positive attitude and need to demonstrate an effort towards math. Another statement, the only way to catch up when you are behind is to work hard and to put in the time to learn. The band builds on their failures. Compensation strategy is where you compensate for your weaknesses. Capitalism strategy is where you build on your strengths. Hunger and effort are better gauges for measuring success than height, strength, looks, etc. Leadership skills are important. Compensating for skills that people are missing or struggling with develop problem solving skills. Gladwell gave the example of someone with dyslexia. When they delegate to others reading and writing they are developing their problem solving skills and they are learning how to talk and be persuasive with others. In other words, they are developing their oral communication skills. Dyslexic entrepreneurs are those who managed to compensate for their disability. Class size – students learn to compensate for the lack of teacher attention in bigger classes therefore they develop compensation skills. Question: How do we create learning environments that encourage the practice of compensation skils? 3rd Lesson: Learning strategy- It is best to zigzag not follow a linear path – the best learn through trial and error over a period of time before becoming great. Gladwell gave the example of an experimental inventor who finds their way to genius through trial and error. Cezanne is an example of an artist who practices this type of learner. Incorporates the idea of feedback – timely and targeted feedback. Trying something and then the feedback helps make this a success. How the learning takes place is more important than where the learning takes place. After a long day of flying, and thankfully little delay, I arrived in Washington, DC for the NECC on Saturday afternoon. I had a great start to my NECC experience by starting off my Sunday morning with a tour of Washington, DC. I signed up for a bus tour and enjoyed visiting the different monuments around the city with an excellent guide. I got to visit a number of famous historical monuments including the memorials for Lincoln, FDR, the Korean War and the Vietnam War. I also got to see the Capital building, the White House and the Washington monument. All in all it was an informative tour that makes me want to come back again to explore the city's other monuments and museums. Check out my Flickr album for some photos of my tour and other sights around Washington. I am very excited to see the conference get underway. I'm looking forward to hearing the keynote tonight, Malcolm Gladwell, author of Outliers. My goals for this conference are to learn as much as possible about the integration of educational technology into my current practice. I will be starting the new school year with a SMART Board and I look forward to learning more about this amazing classroom tool. I also look forward to meeting a number of people that I have connected with over the year on Twitter and other networking sites. I'm guessing this will be a life changing experience and have a great affect on my current teaching practice. Stay tuned as I write about some of the sessions I will be attending this week. reallocating resources and using recycled furniture, principal William Demille made a commitment to transform this new school into a universally designed environment with Speaker systems in every classroom, Smartboards, document cameras and much more. The staff and students will always feel a sense of connection after experiencing such turmoil and change. The transformation has just begun." Here is their video. 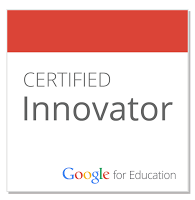 I hope to make one about our school next year after we have gone through "Structural Innovation". I find a lot of what they are talking about similar to what we will be doing at our school next year. I'm very excited to be attending NECC in Washington, DC for the first time at the end of June. 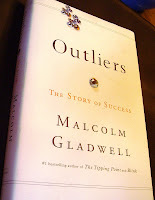 In preparation for this conference, I have been reading Malcolm Gladwell's book Outlier. Gladwell will be a keynote speaker at NECC and I wanted to know more about him before I saw him at the conference. I find it exciting to know that a British born Canadian journalist is a keynote speaker at such a large American conference. If you want to know more about this book, Amazon you can read the description on the Amazon website. Amazon has also included two videos from Gladwell on their website. Video 1 and Video 2. I always find it interesting to hear authors talk about their books. Gladwell shares his theory about why people are successful. His theory is that people aren't just successful because of their merits, but more simply because of what time of year they are born. He calls this the Matthew Effect. This advantage stems from the arbitrary dates our society uses to make up such things as sports teams or when a child can enter Kindergarten. Children born just after the cut-off date are retained a year before entering school or starting a sport. Afterwards, they are considered more talented or able when in fact they are simply more mature. Gladwell presents an interesting case using famous examples of people such as the Beattles and Bill Gates to explain how long it takes to master a skill before you can be considered a real talent. These bands or people were not overnight discoveries, they were people who practiced their craft over 10,000 hours before they were "discovered". Through this practice, they are considered to be masters of their craft. For people like the Beattles and Gates, they happened to have put in the practice time soon enough to demonstrate their skills at the right time. Not only talent, skill and practice contributed to their success, but timing and circumstance as well. These are only two of the ideas that Gladwell talks about in his book. 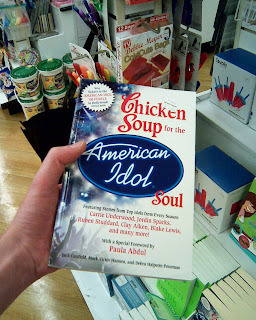 I found the entire book to be food for thought and encourage everyone to read it. You will be talking about it for years to come if you do! My school division is in the midst of studying "structural innovation". It struck a committee in the fall of 2009 made up of teachers and administrators who were interested in studying this more in depth. They were sent to other schools, mostly in the US, to observe and gather information about alternative school structures. I wish I had been able to join this committee, but couldn't find the time to fit it into my schedule this year. By the third day, I had seen enough bullet points to last me a lifetime. I'm guessing by the style of the presentations, the presenters were limited in what they could say or were asked by the division to produce a Power Point that could be officially approved and then be distributed. For me the end result was a blur of information and an inability to recall what school had what structure. The only exception was the school in Australia. I can clearly remember what the students said in the video. The fact that the video was the most memorable part of all of these presentations says to me that the presenters would have been better off presenting photos or videos taken of their schools and then constructing their presentation around that. They could still have had a hand-out to distribute with more information, but more visuals would have been helpful. In reflecting on this experience, I think that more time needs to be spent in teaching the art of using presentation tools, such as Power Point, to educators and students in general. I don't mean this to be a criticism of the presenters themselves, I just think that there has to be a better way to support presentations then projecting handouts up on the big screen and then reading them to me. Finally, I remembered hearing once that a presentation should be a summary of the handout and that the handout shouldn't be a summary of the presentation. I try to keep this in mind when I'm giving a workshop or a presentation. I'm just wondering what advice other people might have for those giving presentations so that they don't get caught in the "bullet trap" of Power Point? A NYC School's version of "Teacher Idol"
I have read with interest over the past couple of days in the New York Times and on ransomtech's blog about a new school in New York city who recruited the best teachers to come and teach at its new school in the fall. The school didn't just go out and observe these teachers in their element (their classrooms) and then offered them a signing bonus or relocation budget. Instead, they clinched the deal by offering them contracts with a pay of $125,000 a year and a chance to earn up to $25,000 the following year for high performance of their students. This is an interesting idea as the school's founder, Zeke M. Vanderhoek has decided that excellent teachers, not small classes, the latest technology or talented administrators make a school great. It will be interesting to see how these 8 teachers make out next year with extra responsibilities, longer hours and more students then the average NYC classroom. The principal, Mr. Vanderhoek himself, will earn less than the teachers, $90,000. I've had to take a break from blogging over the past month or so due to my involvement in my school's restructuring for next year. Our school board has undergone a renewal process and launched the opportunity for schools to propose a new innovative school structure that involves teacher collaboration, project and inquiry based learning opportunities for students, flexible time tabling, mixed groupings and a focus on literacy and numeracy skills. Our school decided to take the board up on its challenge and submitted a proposal. In the end, we are one of ten elementary schools and four high schools to be chosen. We are very excited about next year. I'm most excited to be moving into a classroom with a SMART Board. I will be moving into a larger classroom that will have room for students to work on project-based learning opportunities in the afternoon. I will also get to use the SMART Board for my literacy and numeracy blocks in the morning. The structure we proposed is outlined in a Power Point presentation I created to present to our staff and parent council. I have posted it to Slide Share to include it in this post. I have also included the draft of the handout we produced to distribute at our Board's Annual General Meeting last week. I don't have a digital version of the final draft. View more presentations from bobiashj. View more documents from bobiashj. As we embark on this new structural innovation, I would love to hear from others regarding our plan. Have you implemented similar plans in your school or division? How have you used SMART Boards in your classroom? Do you have other ideas or suggestions after reviewing our plan? During my school's Heritage Fair this year, students had the opportunity to do an audio scavenger hunt (in French as we are a French Immersion school). Two classes (Grades 3/4 and 4/5) had the opportunity prior to the fair to script and record podcasts about their projects. They were then asked to compose a question that could be answered by listening to their podcast. I posted the completed podcasts online and provided the students with a question sheet to guide their scavenger hunt through the podcasts. Students really enjoyed this activity during our Heritage Fair and I would definately look into doing it again during next year's fair! Digital literacy portfolios are a way of presenting individual student work that is stored in digital form. Sharepoint was used to host the eportfolios. If a teacher logs on, they see all of their students. If a parent logs on, they only see their child's work. Provides a richer view of a child's learning. Provides an explanation of learning expectations. May assist in the providing information to Student Services Coordinators. Assists in the assessment for and of learning. David used Prezi.com to make his presentation. Definitely something I'm going to check out for making future presentations. Teacher must be a master learner and practice these skills in front of its students. Share something you learned in the last 24 hours. Second Life allows us to create a library without constraints. David is a result of a "perfect education" who performed repetitive tasks, in straight rows. Preparing a workforce who would work in a career for 30 years and then retire. The telephone has changed the way we do things. It is now an example of redundancy where technology has changed to not require it anymore. Print newspapers are migrating to the web because they are too expensive to print anymore. We are spending too much time teaching children on how to use paper. It is important to teach them how to manipulate digital information. Webcams & Skype are breaking down the walls and allowing people to participate even when they can't travel or afford to go to a workshop, conference or class. Conclusion: We need to stop integrating technology to teach how to use tools, but we need to teach literacy to be able to process and understand information landscape of the future. We need to be able to ask questions and be skeptical of any information that is provided to us. We need to question where it comes from. We need to develop critical thinking skills. We need to be "digital detectives" and backtrack to see where our information has come from. Collect digital clues to see the source of the website. example: http://martinluthrking.org/ is really published by a white supremacy group called Storm Front. We were brought up in a generation where teachers gave us information and we could trust it because they knew the source. Digital information is different because we don't always know the source. How to understand numbers: Library of Links from Landmark tools on http://landmark-project.com/, click on raw data. Demonstration of how to understand numbers using spreadsheets like Excel. Writing: audience is wider by the way that final product is presented. Video is very powerful and shared with the world on the web. To whom are we communicating? Expressing ideas in different ways: schools who don't prepare students for their future are sweatshops preparing students for our pasts. We must include ownership of information in our definition of literacy... respect of ownnership, accuracy and infrastructure. Sharing of a website: We're Not Afraid.com a website made by a student the day after the London bombing. Anyone could post photos. For a great concept map of his presentation, see it in Warlick's Conference notes. Dean did his presentation using Cooliris. Definately something I want to check into. Smart Phones and other mobile devices - video "iphoneu" "tonchidot" "poll everywhere"
Time Shifting - What is Face to Face good for? - taking lectures out of school time and spending the time working together at school. Open and Connected - free stuff online - MIT Open Courseware, online courses how to offer distance learning. The World Is Flat by Thomas Friedman = Great Book! I like how he is using the Identity 2.0 presentation format with lots of pictures in his slideshow. Conversation format is interesting. Darren is live on a TV and not here in person and the others are sitting on chairs at the front of the room. Clarence: making global connections made him aware of the world being a big place and needing to connect with others. Kathy: started blogging and someone else commented meaning that someone else was reading it. Connected globally with New Zeland. Importance of getting kids getting globally connected. Dean: nothing like getting kids to talk to other kids about what they are really living instead of learning everything from a book. Darren: Alan Levine BloggerShop was inspiration for getting active online with students. 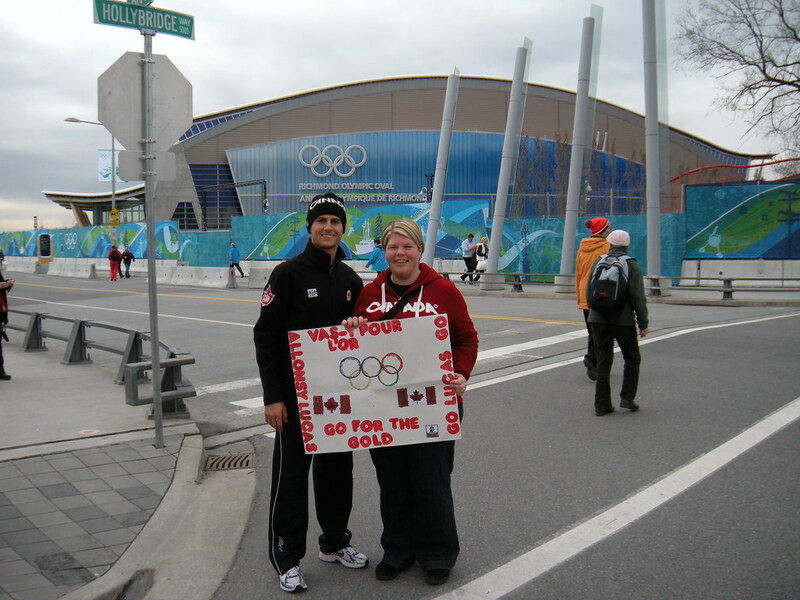 Now blogs with students and professionally. Sharing of their classrooms: what a day looks like in their rooms. Tech is integrated as part of what the students are doing all day in the classroom. Authentic, real learning is done through sharing and world partnerships. I like the idea of having students "writing their own textbook" that is good enough that learners can educate themselves reading the book. Darren has a "How To" for setting up the online textbook in the class. How do you find the time? Everything is a choice. Making online learning a priority. You have to give some things up in order to change the classroom. Demonstration of using numbers board to demonstrate the use of the smart board to represent a number. Demonstrating Locking feature of Smart Board and screen shade and spotlight use on web. - smart education shortcuts to lessons. Reason to build collaborative projects is to make friends outside of the school or classrooms. Enables students to learn how to network. Join Ning Groups and put your name out into cyberspace. When blogging, students need to develop their network to get feedback and hits on their blogs. Find a topic that really interests you because you are going to be spending a lot of time working on it. Develop a project by networking with other teachers that have a similar interest. Idea suggested by Kim to network with last year’s Heritage Fair teachers from Nationals and set something up. Uses wikispaces for unit planning and collaborative project planning. Demonstrated some of her projects right now such as the Iditarod project. Monday morning kicked off with a keynote from Jamie McKenzie on Reading across a Dozen Literacies. Focus on student centered learning and questioning. We need a broadened conception of reading. Movement from traditional comprehension of a text to comprehending a wide variety of objects and materials. "Students must be able to read a face as well as they can read a book." Is "digital" a literacy or is it a means of delivering or exposing people to the other literacies? Dove commercial on "What is beauty" campaignforbeauty.ca "Dove Evolution"
What impact does the media have on our perceptions of beauty? Natural beauty vs. person created beauty? Can we trust Dove? What is in it for them? They make AXE too. Student made parity. "Sloth made" Student synthesis which works in reverse of the Dove commercial to show a model becoming "ugly". Comprehending, Considering, Wandering, Wondering, Pondering all all forms of thinking that are woven together in the thought process when "Thinking"
It is French, English but a paid site. I think it is worth the money. Discussion about photos: Which one is more beautiful? -being able to function in nature reading the signs of nature to survive in the wild (ex: "Beware of the Bears") Having the capacity to "read" the information in that forum and being able to understand it. Link between natural literacy and scientific literacy: the capacity to learn from observation and interpretation of what we see. Scientific literacy used to encompass: natural and environmental literacy and they didn't stand on their own as important forms of literacy. How are we working to understand our differences and to work past them and learn from each other? - the argument against standardized testing in the US.